To make these festive Easter bunny napkins by A taste of home, start with well-starched square napkins. 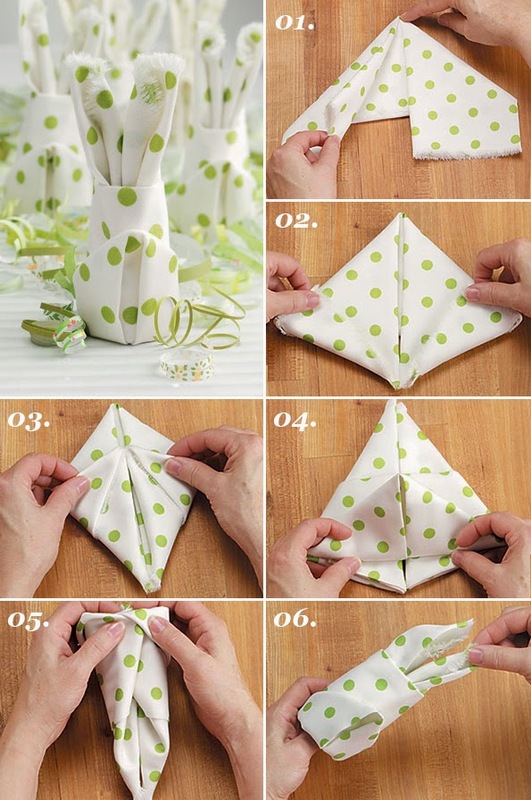 Fold the bottom third of the napkin up and the top third down, making a rectangle. Step 1. Find the center along the top and fold the top corners down, making sure the bottom ends are even. Step 2. Fold up the outside bottom corners. Step 3. Fold left and right sides so that they meet in the center. Step 4. Turn the napkin over and flip the top to bottom. Fold bottom point up. Step 5. Fold the left and right corners to the back and tuck one corner into the other to hold. Step 6. Hold the tucked corners securely and pull out the bunny ears on the other end.